The Alabama-Korea Education and Economic Partnership was founded on the belief that by expanding students’ cultural learning opportunities, we heighten their ability to make an impact on the world. A concerned citizen with a vision gathered leaders to form what would become the Alabama-Korea Education and Economic Partnership. 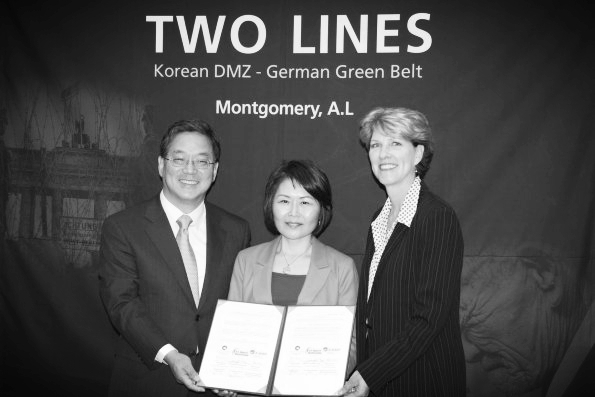 Members of the Alabama School District's Social Research and World History Development Team and A-KEEP's DMZ project team work together to make a special international joint venture project, Two Lines: Death Line to Life Line DMZ 60th Anniversary Commemorative Photo Exhibition, a visual comparison of the effects of war on Korea and Germany. On February 12, 2014, A-KEEP receives a citation from Governor Kay Ivey of Alabama, acknowledging that it provides a gateway to diversity education through academic, cultural and economic exchanges between Alabama and Korea. A-KEEP completes its second annual Alabama Leadership Program, hosting 25, tenth-grade students along with five adult chaperons from South Korea. During this two-week period, students learn about the culture and history of the United Sates, specifically emphasizing history in Alabama. A-KEEP is awarded the NSA endorsed STARTALK grant to introduce 24 elementary and middle school students in Montgomery, Alabama and surrounding areas to Korean language and culture. As the demands of the nonprofit continue to grow, A-KEEP becomes an AmeriCorps VISTA sponsor, recruiting 5 members focused on capacity building.